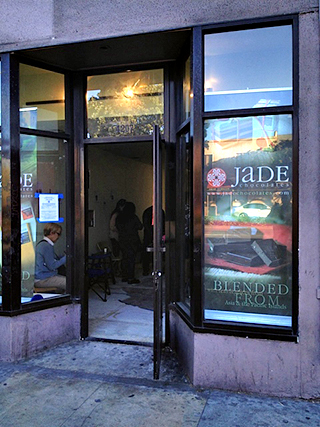 Jade’s new shop is in a great location in the inner Richmond on the main drag, Geary St.
UPDATE: Jade Chocolates is open for business (12/8/14). Jade reached their Kickstarter goal of $20,000 and topped it by an additional almost $4,000. Jade Chocolates is opening their own chocolate shop in San Francisco, and needs your help for the build-out. They have launched a Kickstarter campaign to raise $20,000 by Nov. 18. The shop will be the first local artisan chocolate shop in the Richmond District (my old ’hood where I lived half a block from Sees’ Candies). The location is on Geary near 6th Ave., which gets lots of foot traffic, including everybody waiting for the Geary 38, so this should be a great spot for a chocolate shop. 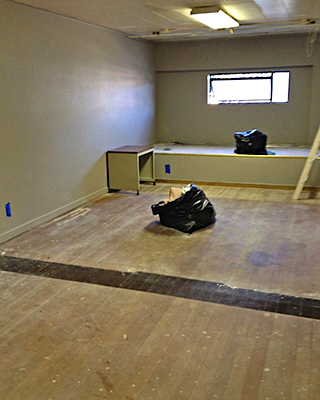 The space is currently under construction with a projected opening date of December 1, 2014. It will be a retail-only shop, not a café, but you will be able to purchase Jade’s full line of Asian-inspired truffles, bars, snacks, hot chocolate and baked goods 7 days a week. 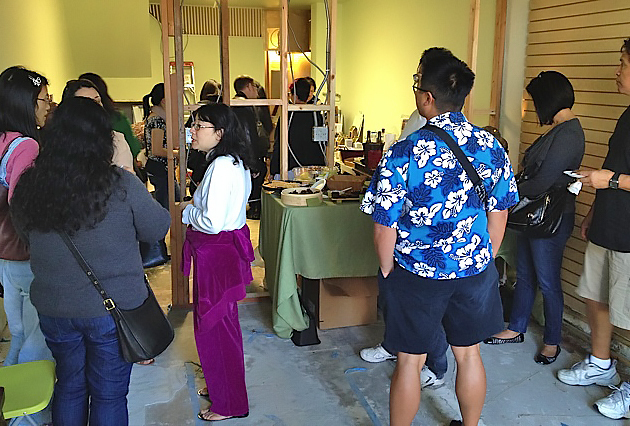 In the midst of remodeling, Jade threw a party showcasing some of the chocolates, desserts and baked goods they will sell in their new space. 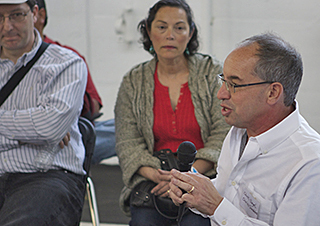 To give people an idea what it will be like, Jade threw a preview party, Oct. 19, 2014, at their space-in-progress. We attended to see what the future holds and to sample some of their truffles, desserts and baked goods. We got to walk around the semi-raw space and meet some fellow Jade Chocolates followers. Jade’s second floor might be the future site of chocolate classes. 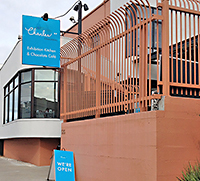 Mindy Fong, owner and chief chocolatier, is planning a simple, elegant retail space on the first floor, but she also has a second floor for storage and possibly chocolate classes in the future. She told us it will be retail only because the bathroom is not up to code for a café, but she will have her hot chocolate to go. And a café is in the plans for her next space. We have only tried Jade’s bars and truffles before, so it was exciting to try some of the desserts and baked goods Mindy will have in the new shop. She had some classic desserts like a pot de creme with nibs, which had a delicious caramelized top note. And she had an Asian-inspired white chocolate rice pudding, which reminded me a little of Thai iced tea. (Mindy said that was the cardamom.) We also sampled the Dragon’s Breath brownies, which uses Jade’s red chili and lapsang souchang tea-flavored chocolate for a slightly smoky, spicy bite. 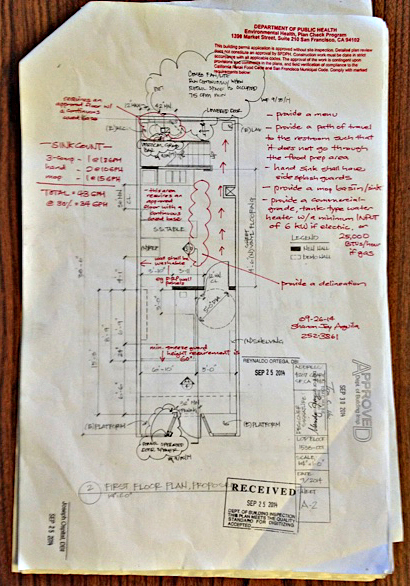 Mindy drew on her architecture background to draw up the blueprints for Jade’s new space. What I am most excited about is that there is finally an easy way to get Jade truffles. Mindy told us the shop will carry her full line of “Fifteen flavors, but I have ten more in my head,” and the new space will give her a chance to expand her line to include those new ideas. We are looking forward to the ginger one she mentioned, but in the meantime, I will be very happy to get the Thai Basil truffle each time. It is exactly what it says. When you bite into the truffle you are immediately hit with the savory basil flavor, which blends nicely into the chocolate flavor, then lingers as the last note. 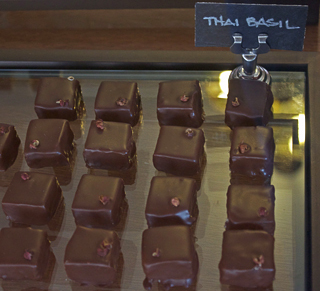 If you can’t wait for the shop to open, you can find Jade Chocolates at the Clement St. Farmers Market (btw. 2nd & 4th Aves. ), every Sunday morning until 2PM. Mindy said she will probably keep the farmers market booth for at least a year to give her regulars a chance to change their habits. I think once you try Jade Chocolates, you will want to support this new endeavor from the hardest working woman in chocolate, Mindy Fong, and her crew of chocolatiers. Nine levels of support range from $16, which buys you 8 handmade truffles, up to $5000, which gives you lots of chocolate, plus a catered party and getting a chocolate named after you. If you like chocolate, I think you can find a level that satisfies your do-gooder instincts and chocolate cravings. Deadline for pledging to help Jade Chocolates is Nov. 18, 2014, so don’t wait. Jade Chocolates, 4207 Geary Blvd. (cross street: 6th Ave.), Richmond District, San Francisco. Date posted: October 15, 2014. 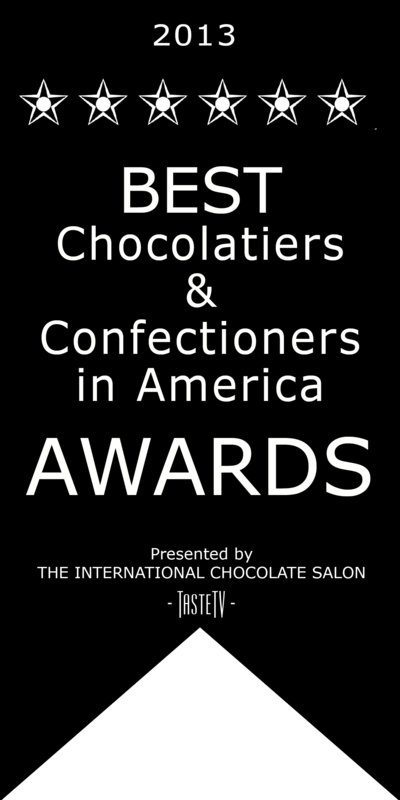 This entry was posted in Events, Featured, Local chocolate, San Francisco chocolate, Update and tagged Jade Chocolates, Kickstarter. Bookmark the permalink.